So this year, we bought our two boys matching bicycles which have been sitting in the garage, gathering dust, until this past Sunday when we took them to a local park to ride those beautiful new bikes for the first time. They had their helmets on and their “happy’ cranked up to 11, so we were ready for a fun family day. Of course, kids will do what kids will do, so once we got to the park, all bets were off. 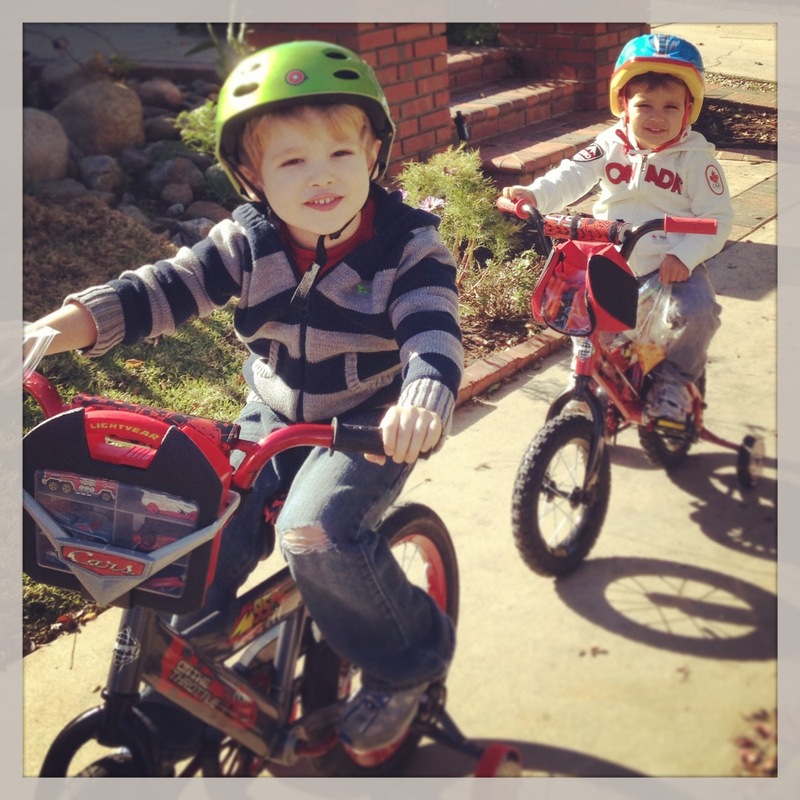 Our 5 year old (Jake) loved it, but our 3 year old, Luke, wanted nothing to do with his bike. So we took off his helmet, hauled the bike (now a ball and chain) behind us and started to enjoy a leisurely stroll instead. A half hour in, Jake took a spill, so we stopped to tend his boo-boo. That’s when we met the Lady in Pink. As we turned to scoop up Jake, I heard a very loud “Watch out! Out of my way! Coming through!” I turned to see the Lady in Pink come careening through on her expensive bicycle at who knows how many miles per hour, narrowly missing my 3 year old. In fact, she cut right in front of him – so close that the curl on the front of his forehead was ruffled as she zoomed past him and sped away. My husband and I were in shock at first. We scooped Luke up, made sure he was okay and got our little family on the move again. And as the next few minutes passed by, I got mad. Very, very mad. The Lady in Pink is not a friend of mine. Completely self-absorbed in her own actions, she sped unheeded on her way, absolutely oblivious to the fact that she just about caused an extremely serious injury (if not something much worse) to the innocent child in her way. The Lady in Pink could have slowed down. She could have stopped. She could have changed lanes. She could have done any number of things which would have been much more appropriate – and much more considerate – of the people around her. Me? I was hopping mad. There aren’t words to describe how I felt. As a parent, I instantly saw all of the possible outcomes – gravitating to the worst case scenario. I immediately passed judgment on the woman. She was massively irresponsible, and if I saw her again, I was going to give her a piece of my mind. I even considered driving around the park to find her and tell her exactly what I thought of her and her bike. We didn’t do that though. We headed back to our car. And as I packed up my kids for the short ride home, I started to think about the roles we’d just played – the Lady in Pink and me. In business and in life, we all play the Lady in Pink at times. Our society is changing rapidly, and as consumer behavior continues to evolve and companies see their margins eroding or business models at risk, we as leaders have to make decisions under pressure. We may make fast decisions, ones with long term consequences that can affect the lives of our people. There is nothing wrong with making a quick decision if needed, as long as we are aware of our surroundings and can take stock of the other options available to us – that we have an understanding of what the long term effects of a short term decision may be. Even in the toughest times in business, there are always options if we look for them. And there will always be those who stand on the side, perhaps unaware at first of the change that is whizzing their way. When change is inevitable, we can choose to participate in the action, prepare in advance or stand on the side, watching it play out and judging others who do take action – whether that action is right or wrong. I learned something on Sunday. I was so focused on a singular event, that I missed the danger heading our way from the other side. I am going to be more alert the next time we are on that bike path. And, I am also going to stand up and speak my mind if I do run into a Lady in Pink again. Next time, I am taking action. I’m going to be part of the change I want to see on the bike path and in the world. And maybe, I can help the Lady in Pink slow down just a little bit, enjoy the view and understand that her actions have consequences, have meaning in the lives of those around her. I hope I can help her begin to see. Tags: Business, Focus, Perspective | Permalink.